In the next section we change narrators, stepping back in time to the Germany of the early 1920s. The youngest child of a large Jewish family in Berlin, Helen recounts their happy family life with its scenes of domesticity, their friendship with the neighbours, whose son Max becomes an important figure in the narrative. But already the storm clouds are gathering. Helen has scarcely time to enjoy her childhood before the shadow of Adolf Hitler falls like a guillotine on the future of this one particular family, mirroring that of millions of others. Events accelerate. As Hitler invades country after country he simultaneously develops his policy of racial hygiene, the final solution to the problem of the Jewish question. The turning point for Helen is Kristallnacht, after which she begins a long descent into horror and suffering. 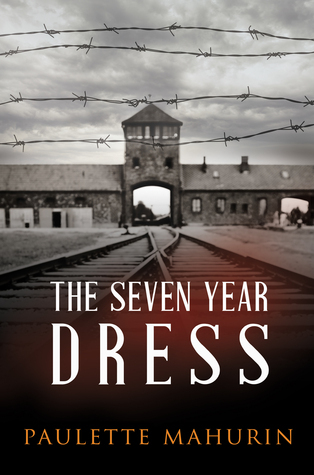 The following years are recounted by Mahurin in a series of relentless episodes: the loss of Helen’s entire family, her years spent in hiding, the deportation to Auschwitz, and her experiences there. This is the part of the book that is most harrowing. It is in Auschwitz that, subjected to repeated humiliation and degradation, Helen is stripped of her identity, conditioned like one of Pavlov’s dogs, ‘dismantled’ as a person. And, amazingly, how she endures, heals, becomes resilient, by observing the altruism of others, by undergoing innumerable transformations, by the realisation that ‘nothing lasts’. Sign into Goodreads to see if any of your friends have read The Seven Year Dress. What a great review. Really well written and it brings up so many important points for all of us to ponder.